t's illegal to hunt, harass, poach or injure any animal in a national park. ARDROSSAN, Alta. — Two bison have been shot and killed in a national park east of Edmonton. Parks Canada says it happened near the north entrance of Elk Island National Park over the weekend of Oct. 17-18. One of the animals was dragged along Highway 16, which bisects the park, to a field approximately 800 metres north of the park where some of its meat was cut off. A white Dodge pickup truck with extra grill lights and a rooftop light bar was seen in the area and may have been involved. It's illegal to hunt, harass, poach or injure any animal in a national park. The fine for poaching bison start at $4,500 to a maximum of $750,000 and/or imprisonment of up to five years. Pat Dunn, an external relations manager with Parks Canada, says the killings are "senseless." "I think we will see a lot of public outrage over this. Lots of people like to come here and look at the bison, wildlife viewing is very popular here and people will be very angry,'' she said Monday. 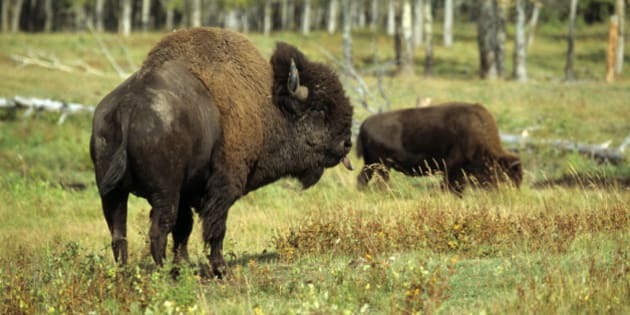 The park, about 40 kilometres east of Edmonton, is divided into two sections - the northern half has about 550 plains bison, while the southern part has about the same number of wood bison. Both halves are fenced in, Dunn said.